Chatwing improves its free chat widget with more customization features. The dynamic chat software has a stable platform allowing a thousand users to communicate real-time without compromising its efficiency. Online dating has gained popularity in the World Wide Web these past few years. This online activity has added another angle in starting a romantic relationship. In just a few clicks, a web user will be able to interact with hundreds of possible partner. Every year, the number of people participating in online dating has increased. It is not surprising since the need to connect and interact is human nature. To facilitate interactive activities like online dating, it is advisable to install efficient chat software. Numerous dating sites are available in the Internet. For websites and blogs that promote online dating, the competition is about inviting more traffic into the site. A dating website may maintain a professional look or convey a playful image. The essential part of the site is ‘lounge’ where people can immediately communicate with each other. 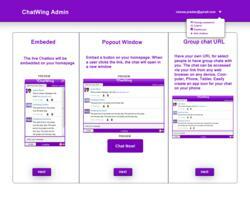 Chatwing’s free chat widget is adaptable to any website and blog. It can easily be embedded in just a few seconds with simple steps to follow. The free chatbox can facilitate a dynamic chat allowing a thousand people interact simultaneously. Chatwing’s regular shoutbox and pop-up window style have this capacity. On the other hand, initiating group or private chats can be done with Chatwing’s vanity URL form. This form uses username and shortlinks to make the activity possible. What makes Chatwing free chat box different from other chat applications on the web is its wide array of modification features. With a lot of options, there are numerous ways to make one’s website and blog stand out from the competition. The improved web chat tool allows CSS customization. Chatwing users can alter the widget’s border design, colors and can upload romantic image to serve as the shoutbox’ background. Make the visitors chatting experience more dreamy by uploading sweet music into the chat app.